Democratic capitalism thrives on enterprising people experimenting with new ideas, inventions and business models. So, hardened skeptic that I am when it comes to 'green initiatives', my invective is directed mostly at those who would pour public money that way (certain long-overdue energy efficiency schemes excepted). And it is a positive pleasure to read that the Co-op is mounting a major green push of their own devising. Will it work ? No idea. Will any good come of it ? Almost certainly: they seem to be going at it with a will, and they are bound to prove or disprove something along the way - at their own expense. Well, partly at ours, of course: it's entirely probable they will stick up some subsidy-attracting solar panels or the like. But in a spirit of bonhommie I'm willing to overlook this and wish them luck. Hell, if they pay me enough I might stick up one myself. The Co-op is a good place for greens (and carrots ...) We shall doubtless have to put up with more of their loonier outpourings, like their campaign against shale gas. Never mind. 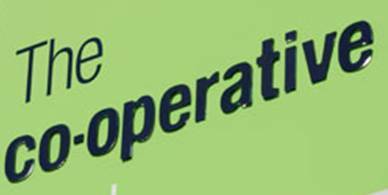 The Co-op's early history was an interesting attempt to introduce a variant on the basic capitalist model, and it has not been without its successes. Let a hundred flowers blossom: sounds red, sounds sort-of green. And it's a good capitalist principle, too. Funny story. Many many years ago I was involved in a printing press co-op in Oxford. We decided to insure our van at the local Co-op insurance branch, as an act of solidarity. So we go in, chat, and they ask what sort of business we are. Oh. Say they. What's that? Rochdale has a number of things to be proud of. Well lets hope its slightly more insightful than their recent renewable green bag policy. Likely the creation of a private green quango, in the same style as fair trade, where the quango pockets most of the cash and the beneficiaries get pennies. But it will make the punters feel self-righteous and that's what's important. The Co-Op do their fair bit of shouting from the sidelines, but at least they are putting their money where their mouth(s) is(are) (it's a co-op, innit). There's nothing more infuriating than apparent Greenies forcing people to do what they otherwise would not, whilst at the same time doing exactly the thing they are stopping people from doing. Isn't any business, that isn't a sole trader, or a limited company, ie 2 or more people in partnership, a co-operative by another name? Or does the definition of co-operative have to include ownership by the workers(which is the case in a lot of small businesses anyway) and/or the customers? Isn't Tesco doing the same sort of thing or at lest claiming to do this solar panel thing at least, some of these big superstores use so much electricity, mind you they do not pay the same per unit. Reference your previous post on PMs, Silver. As you are probably aware there is a lot going on behind the curtain that is about to blow...revolving around JPM positions and other short positions, and derivatives that these shorters have created. Respected researchers have established that at a Silver price of C. $36/oz, these derivatives start kicking JPM with mounting losses, grading up to a Silver price of $60/oz, where the Derivative losses would be large enough to collapse the US, Fed, etc. I don't want to get into semantics about derivatives, who is behind JPM nakedness, etc..I want to explore the likelyhood of a signal/physical default by JPM in Silver (given global backwardation for months in front)dominoing into affecting ALL global paper assets via derivatives issued by these idiots,.... the future of options/futures/price discovery, etc, and the locations, (other exchanges) where price discovery may be re-established, perhaps in a more honest environment. The default on the physical may not come in March, but the insane shorting in order to protect fiat/interest rates/ yada, yada, pretty much guarantees it happening in the medium future. The paper control globally is failing gradually, as circumstances move beyond parameters set by the previous issuance of these derivatives. The notional value of this crap, not the "Net" that the BIS shows, could potentially boil the world. recent moves could well result in Silver (lack of) being the trigger point. My thoughts are Junior Miners for investment purposes, but worries about price discovery exist. Difficult, I know, but I would really appreciate your thoughts. Jim - a lawyer could no doubt offer you some salient differences. I'd say that the classic farmers' co-op is distinguished from a joint stock company by virtue of the fact that the members all participate actively instead of passively (but that doesn't quite capture The Co-op). ah, the romance of capitalism ! Thanks Nick, I'll look forward to it. The real difference between a partnership and a co-op is that you have to buy into a partnership (lawyers newly promoted to partner have to take out a mortgage on the firm's assets, for instance), where you just have to acquire the necessary status to become a member of a co-op - either by shopping at the Co-op, or (for an employee's co-op like John Lewis) by accepting an offer of employment.